My wife picked up two bottles of their cider from our local store, and we had a chance to try them out tonight. One was their “Dry Cidah” which clocks in at 6.5% ABV. The other is their “Homa” which is a dry cider dry hopped with Cascade hops, and that is 6.8% ABV. Looking at those numbers, that is pretty close to what I get from my cider, so I suspect it is just straight freshly pressed cider that is fermented dry. They do say that their ciders are not filtered, which makes sense when you look at them. Aroma: Crisp apple but not very strong. Pleasant. Pretty clean otherwise. Taste: Nice apple taste up front, with a little acidity to balance it. It fades fairly quickly. It is dry, but has a long finish that seems to coat the tongue that is not entirely pleasant. Mouthfeel: Very thin, which I would expect from a dry cider. Aroma: Green herbal and citrus (lemon) notes. I don’t smell any apple at all. Taste: Orange/lemon flavors followed by herbal green notes, with no real apple notes. The hops flavor just carries all the way through, leaving a slicker, herbally taste on the tongue. Mouthfeel: Thin, but has more body then the Dry. Critique: The Dry Cidah is actually one of the better commercial ciders I have had, but it is still a bit thin on the taste and the aroma. 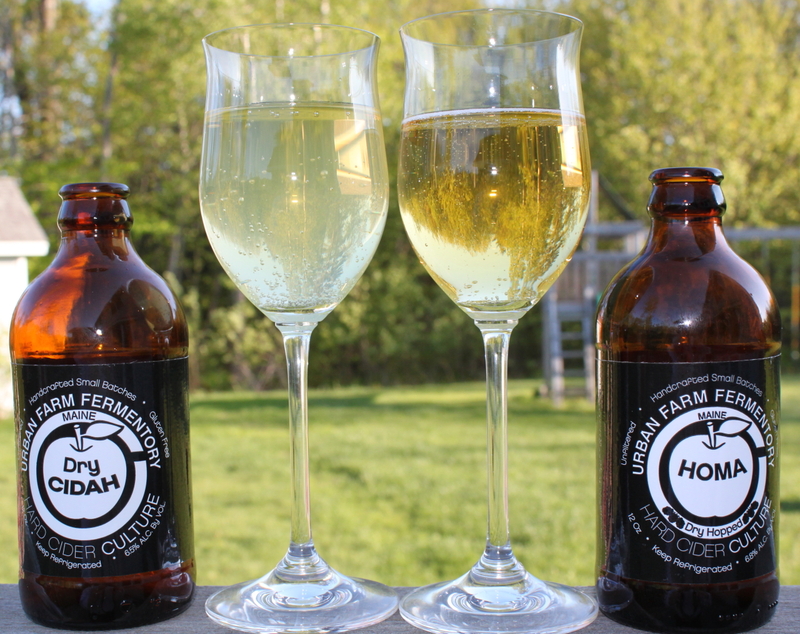 Dry ciders tends to not have as much taste as people think, the lack of sugar seems to hide the flavor. If you don’t like a dry cider, just put a little simple syrup in, and try it again, it just seems to blossom. That being said, this was pleasantly apply, but I just could not quite get past the finish, which has an odd quality to it I just can’t describe. Not helpful, I know, but I just can’t put into words what I was tasting. The Homa I did not like at all. It just did not work for me. I like dry hops in beer, but it just overpowered the taste of the apples, and I got more herbal and green notes than the citrus from the hops. I applaud their creativity, but just not my bag. As a comparison, I poured some of my latest cider. Mine has just much more apple on the nose, but has a faint woodiness to it from the oak. The apple flavor was much more pronounced. It was much more tannic, and had a much fuller mouthfeel, but was very dry. Overall, I preferred mine pretty much across the board.